Tonight, Megumi would be going for another match, and this time, after Ryuko, she would be facing Shizuku Himuro, a fellow alumnus of Wrestle Angels like her. It's been a while since the last time she saw her, and back then in the old promotion, the two of them had fight against each other multiple times, but Megumi considered her to be nothing more than an acquaintance. Even so, Megumi was looking to give herself a good standing in this promotion, and what better way than to win matches after matches? So, already wearing her signature shoulder-less leotard, Megumi would make her entrance when her music was played. Making her way down the ramp, slapping the extended hands of her fans, Megumi smiled at them as she was showered by their cheers and adoration. Despite her lengthy absence in AFW, she still got quite a lot of fans, and she would show them why she was considered the Combat Genius. 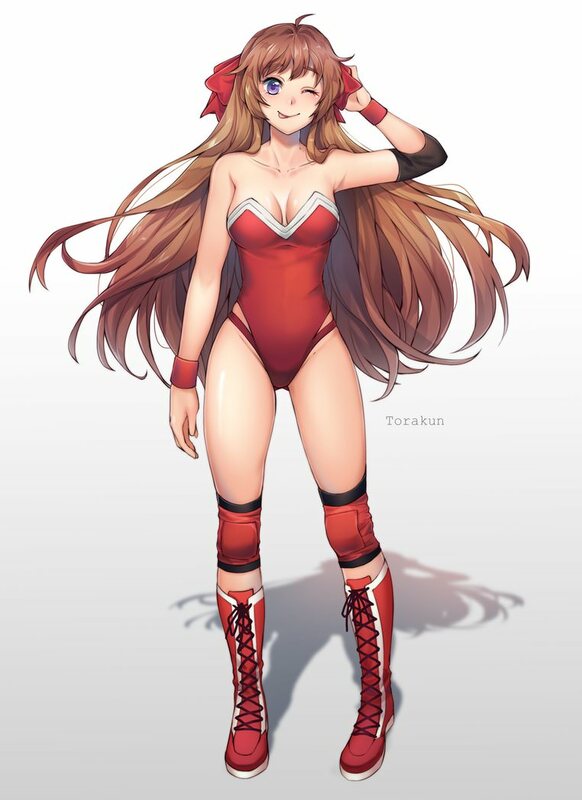 Once Megumi reached the ring, she would grab onto the rope before climbing up the apron, slipping into the ring nimbly, sticking a perfect landing onto the mat. She continued raising her arms, rousing the crowd before she gave them a grateful bow to every direction. Once she was done, Megumi would wait for her upcoming opponent, Shizuku Himuro, as she would head over to a corner, leaning against the turnbuckle while draping her arms over the ropes. Her eyes remained focused on the entrance as she waited for her opponent to arrive. "Might I see your hand...Megumi?" 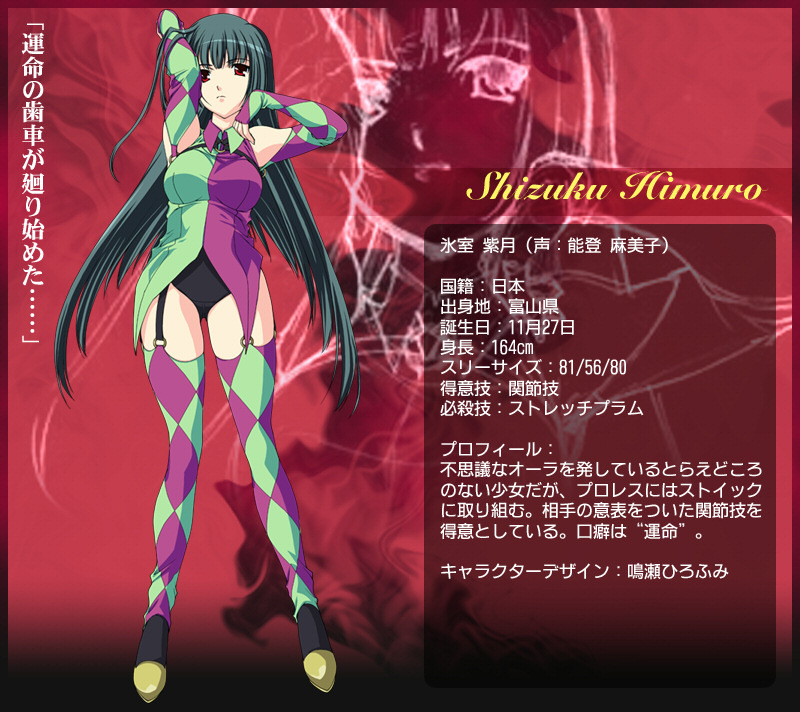 Megumi waited for her opponent to show up, and when she heard an entrance music, she turned her attention at the entrance before she saw the figure of her opponent, Shizuku Himuro. Megumi controlled her breathing, trying to calm herself as she reminded herself that Shizuku wasn't one to be underestimated, her quirks notwithstanding. After all, she was the one who usurped the throne of the Submission Queen from the Venus of Submission herself, Toshimi Minami. And as far as wrestling styles were concerned, both Megumi and Shizuku were opposites to each other, with Megumi favoring strikes and high-flying maneuvers while the psychic herself excelling in submissions. The Combat Genius waited for the psychic to enter the ring, still sizing her up to see how much she had changed since then, back when they were still in Wrestle Angels. And then, she saw Shizuku going to the center of the ring, and Megumi decided that she might as well the same, meeting her in the middle. She stepped away from the corner, taking confident stride as she would close in to her upcoming opponent. As she finally stood before the beautiful psychic, Megumi quirked one eyebrow as Shizuku asked her if she could see her hand. Well, she was a physic, so she was probably going to read her palm or something. "Oh, sure, I don't mind..." Megumi would bring up a hand so that Shizuku could do her reading. But, as soon as she was about to let her palm be read, Megumi would retract her hand, having second thought about this. "On second thought. I don't think you want to see yourself lose ahead of time. That'll be discouraging." Once again, the boastful side of the Combat Genius resurfaced, and the reason why she did this was to gauge Shizuku's reaction to see how she would react to this kind of thing. All manners of divination's require consistent practice in order to keep one's skills sharp and attuned, and offering her palm reading skills to an opponent was just one way Shizuko kept her clairvoyant skills from becoming dulled. The sheer diversity amongst the roster of W.A. meant that Shizu encountered individuals from all walks of life, from the cherubic innocence of Cutey Kanai to the darkened hellscape that Dark Star Chaos heralds from. Although not everyone were willing participants, the ones that didn't shun her curiosity provided Shizuko with ample experience in foreseeing other's future's. As awkward an encounter as it could be, it was also one of the few means of breaking the ice with others that Shizuko could think of. The Psychic Submission Queen was intending to do the same today with the affable Megumi Mutoh, whom Shizu was never particularly close with considering their polar opposite persona's. Her boisterous confidence never quite rubbing Shizuko the right way, which led to them traveling amongst differing cliques in the locker room. A trait of Megumi's that she apparently hasn't grown out of as she yanked back her extended hand right when the psychic was beginning to determine the associated element of her hand. Shizuko flinching from the sudden hand movement before breathing an exasperated sigh, than clenching her hand into a fist and lowering it to her side. "...*sigh*...still such a child. We all have a hand in shaping our own destinies, and I only wished to provide you insight that may further illuminate your own path. And yet you choose to remain unenlightened. Pitiable..." Shizuku uttered with cold confidence and a bewitching glare to her crimson eyes while beginning to backpedal, than going into a well-honed grappling stance with the ring-bell chiming off in the distance. " Very well, let's see whose conviction withstands this day. Perhaps I can perform your palm reading while I contort your arm in excruciating angles, and whisper my findings into your ear after my submission victory..."
Megumi tilted her head, already expecting this kind of reaction from the psychic. She didn't mean to make fun of Shizuku's passion in psychic or anything like that, but if there was anything that she would say about herself, it would be that she wasn't one to believe in superstitions. The Combat Genius clenched her withdrawn hand into a fist as she gave Shizuku a confident smile, the one that she wore whenever she was presented with a challenge. "I'm sorry, but I don't really put much stock in fortune telling and destiny," Megumi said, placing her left hand on her waist. "I'd rather use my hands to shape my future than letting the lines of my palms determine the outcome of everything I do in my life. It's pretty restrictive, you know?" Like Shizuku, Megumi would also take a stance, arms raised and legs bent as she prepared herself to clash with the Submission Queen. "Well, feel free... if you manage to do that, of course," Megumi replied back before she made her move, closing in to start grappling with her opponent. Being used to fast-paced chain grappling, the Combat Genius would try to quickly transition the grapple into something else, hoping to twist Shizuku's arm into an armlock, which she suspected would be easily countered by her opponent, but she had more plans other than the armlock, and she wanted to see what the psychic would do next. Enduring the stubbornly unenlightened who refused to open their minds to the subtle indications of what fate potentially has in store for us all...was simply an irksome fact of life for the Clairvoyant. It was if Shizuko held the keys to opening their mind but they refused to be shone the light in fear of realizing that destiny may just have a predetermined outcome for our lives...and eagerly rebelled against any notion of a fated destination. Foolishness...that's what it always was. And Shizuko saw fit to educate the Combat Genius on the error of her addle-brained thinking when she so indifferently rebuked the Clairvoyant's palm reading offer and the very notion of psychic abilities. Shizuko remained at the ready with a cold and calculating glare and mindful footwork before stepping up to grapple with the auburn-haired veteran. A brief intertwining of their arms coming before a swift and sudden arm lock twisted Shizu's arm to the side. "....." Shizu flinched sharply while bending herself over to relieve the contorting stress on her shoulder joint, but remained stoically silent from Megumi already gaining the upper hand. The Submission Specialist taking a soothing breath before reaching over with her other hand to clamp onto her opponent's wrist and reverse the arm lock with one of her own...but for an added spiteful twist, would abruptly tug her opponent's arm downward to spike Megumi's shoulder off the canvas in a snap arm wringer. Locking Shizuku's arm in the armlock, Megumi planned to bring it to her back in order to put her in a hammerlock, but as expected from the one specialized in submission hold, Shizuku easily reversed the hold against her. And not enough with that, she also went to tug her arm downward, bringing Megumi down into the mat shoulder first with a snap arm wringer. "Grkh!" Megumi grunted as she hit the mat, feeling sore on the affected area, but still this early in this match, Megumi wouldn't be out of it for long as she would quickly roll herself over onto her knees. "Owh..." Grunting as she rubbed her shoulder, Megumi looked at Shizuku, anticipating her next move as she would rise back up on her feet, preparing herself for what Shizuku would try to do next. The psychic had proven herself to be a dangerous combatant from the way she reversed her hold, so Megumi would have to be extra careful while dealing with her. A dash of spite may have inadvertently motivated the normally emotionless psychic to resort to ruthlessly slamming Megumi's shoulder down into the canvas with that much unadulterated force and impact. But Shizuko wanted to firmly impress upon the non-beleiver that she was not an opponent to be underestimated in the slightest, especially considering she had brought other W.A. 's to tears from the amount of ligament stressing submissions she put them through. "Hmph..." Shizuko confidently scoffed from bringing the auburn-haired fan favorite down to the mat so callously, then flicking her splitting hair behind her as she continued to approach Megumi even while she was still recuperating and willing herself back to her feet. The diamond decorated psychic coldly attempting to reach out and grasp onto Megumi's aching arm once more by her wrist and yank it over Shizu's shoulder from behind her, all before trying to painfully slam Megumi's arm down on top of her shoulder. Even as Megumi was recovering from being brought down earlier, it seemed that Shizuko wasn't planning to let her do that as she approached her and grabbed her by her aching arm. Then, she yanked said arm over her shoulder before she slammed it down on top of her shoulder, eliciting a pained cry from the auburn-haired girl. Grimacing in pain, Megumi would try to stagger away from Shizuko, knowing that staying idle would give the psychic more chance to attack. She tried soothing her arm as she would keep her eyes on her opponent, hoping that whatever Shizuko would throw next could be countered by the Combat Genius. The methodical targeting of Megumi's worked over limb continued unabated as the split-haired psychic slammed her opponent's arm over her shoulder before releasing it. Unknown to perhaps only the most eagle-eyed of observers was that Shizuko had been targeting the same limb whose palm Megumi refused to allow her to read. A bit of subconscious payback for Megumi's unwise decision to not accept the clairvoyant's guidance. "Pain is merely the opportunity for enlightenment, Megumi...so allow me to present it to you..." Shizuko coldly stated in her steady, unsettling approach towards the grimacing W.A. veteran, crimson eyes locked onto her opponent as she picked up her speed the last few steps before twisting around and to Megumi's side. The clairvoyant snugly slotting her head underneath Megumi's armpit while interlocking fingers around her opponent's waist, hugging the two veterans tightly together in the precursory movements to an attempted Saito Suplex that would slam her auburn-haired foe squarely atop her head and shoulders.